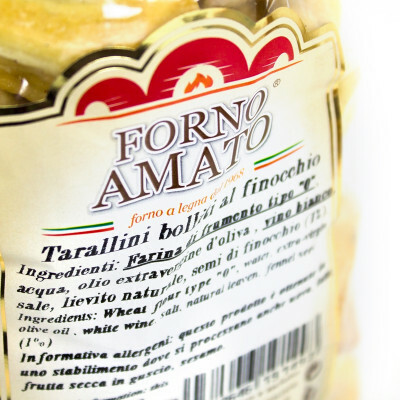 Naturally handmade, Ideal to serve with your aperitifs, this kind of tarallini is also a perfect match to any of your meals and a simple, yet tasty and genuine snack. They are made following old recipe with the main ingredient varying depending on the flavour, in this case: fennel. 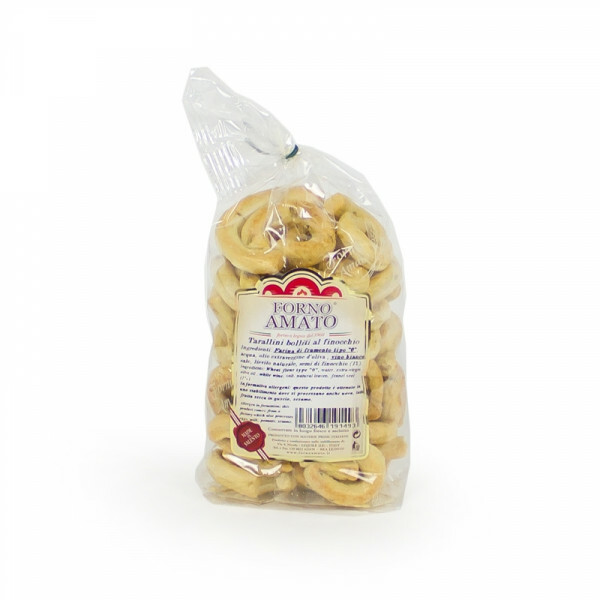 They are aromatised with white wine and extra virgin olive oil. Selection of the best ingredients and accurate baking make Taralli exquisite food to eat during the meal or as a tasty snack throughout the day. Bear in mind that they can be quite addictive! GLUTEN . Wheat flour, water, olive oil, white wine, salt, yeast, fennel.